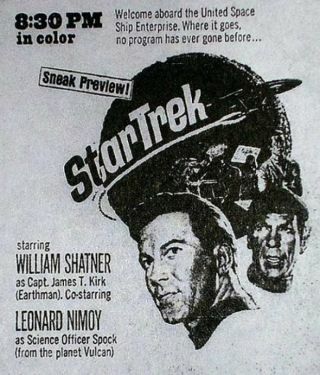 Promo ad for Star Trek, 1966. Forty-seven years ago today, a science fiction icon was born that would live long, and definitely prosper. I'm talking, of course, about the original TV series of "Star Trek," which launched the U.S.S. Enterprise into deep space (and our hearts) on Sept. 8, 1966 and that starship has been boldly going ever since.